Three has always been a magic number for South Korea’s Hong Sang-soo: This is a director who loves, loves, loves an emotionally messy ménage à trois. So it’s no surprise to see another romantic trio forming at the beginning of Hong’s latest, or that this bitter comedy is located squarely in his thematic comfort zone. 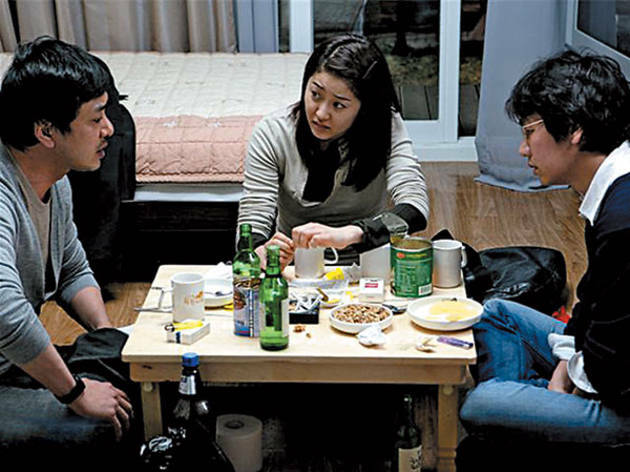 Anyone lucky enough to have caught any of Hong’s previous work knows that Director Kim (Kim Seung-woo), a filmmaker, will make a play for the attractive girlfriend (Ko) of his underling (Kim Tae-woo). Per usual, psychological pole-positioning takes place over socially awkward, alcohol-fueled dinners, and the male of the species—self-centered, oversexed and borderline infantile—gets soundly skewered. “But there are some good ones out there, right?” asks Kim after his conquest declares that Korean guys are the pits. Her sad smile speaks volumes. Newcomers intoxicated by Hong’s amorous pileups and power plays will hopefully treat the movie as the gateway to an incredible back catalog. But by the time the protagonist introduces another female into the mix, Woman on the Beach will elicit a “Haven’t we seen this before?” from the converted. The familiarity of the proceedings doesn’t necessarily breed contempt, as the director’s ability to nail narcissistic immaturity still yields rewards. When a potential third love triangle turns into a false alarm at the end, however, the broken cycle signals that one battered romantic is ready to move on. It’s a lesson the director may want to take to heart.